Little Gertie was found as a stray and taken into the vets by the lady that found her. Poor Gertie was very underweight. Her spine and ribs sticking out and her fur all matted. She is also completely blind. Despite informing all the authorities, posters and hundreds of shares on social media, no one has come forward to claim her so we are looking for a new home for her. We believe Gertie to be around 15 years old. She is such a gentle and sweet natured dog that doesn’t let her age or the fact that she can’t see hold her back. She is inquisitive and likes to explore. She has cleverly begun to map the house of her foster home and now knows her way around downstairs. She doesn’t seem to mind other dogs or cats in the house and just ignores them if she comes into contact with them. Gertie is still undergoing blood tests and checks, but it has been discovered that she is diabetic. Her new home needs to be confident to give twice daily insulin injections (this will be demonstrated, but is very simple and easy to do) The timing of these injections is very important and also her strict food intake and schedules. She is still being monitored, but she does need very regular trips outside or she can tend to wee in the house - which is completely understandable given her age and diabetes. We have discovered that she is very unsure about being on grass, but will happily have plenty of wee’s on slabs or concrete. Gertie has been through so much. We know nothing of her background or who had her previously. She is very anxious if she is left alone and needs someone that can be with her all the time. She will happily stick to you like glue and gets upset if she doesn’t have someone around to give her reassurance. 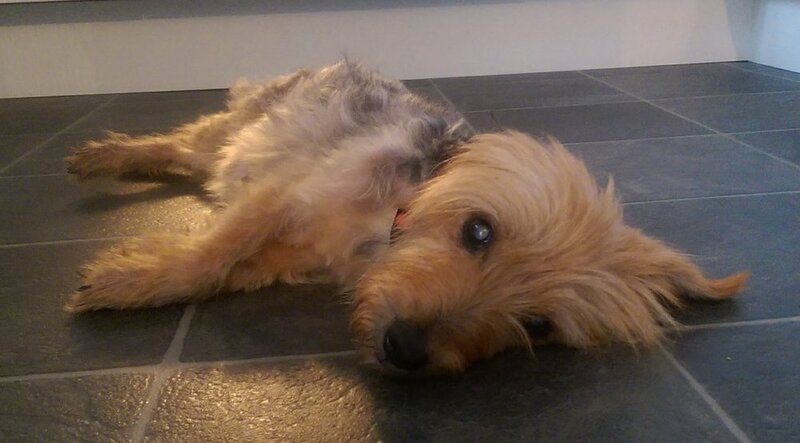 It must be a scary time for a little old blind dog who doesn’t know where she is. We are sure that given time and when she has settled into a new home and routine, her separation anxiety will not be quite as bad. It was also discovered that poor Gertie would have been suffering for quite a long time with her teeth. Many are rotting and decaying and this can not only cause pain for her, but infection can also affect internal organs as well. Although it can be a risk at her age, we have discussed it with vets and we hope to be able to get her dental done this week when her bloods are more stable and has put a little bit more weight on. Above all this, Gertie has stolen the hearts of everyone she meets! All the vets love her and her sweet nature wins everyone over. It must be so frightening to not be able to see, but she is so trusting of people. She really is a lovely girl. Who knows what her life before was like. We can only guess. But what we do know for certain is that Gertie deserves to live out her days being loved and spoilt. Gertie needs a quiet home where there is someone around all of the time. She needs someone that is understanding of her age and medical condition and is not going to be put off by little accidents in the house if she can’t hold on to get to the garden. She will be more than happy spending most of the day snoozing on a lap and getting plenty of cuddles. Stourbridge RSPCA will continue to cover any medical costs related to her diabetes provided she is rehomed in the branch area and able to be taken to our vets - Powis and Partners.